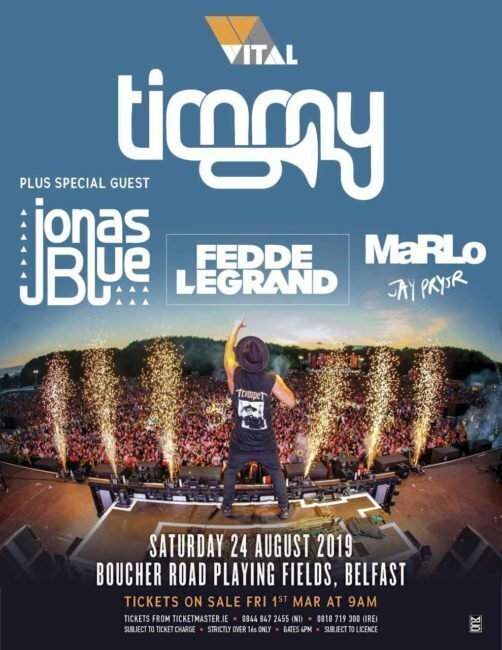 Following his sold Out Belsonic show in 2018, Timmy Trumpet returns to Belfast along with special guest Jonas Blue, Fedde Le Grand, MaRlo & Jay Pryor at Boucher Road Playing Fields Belfast on Saturday, August 24th. 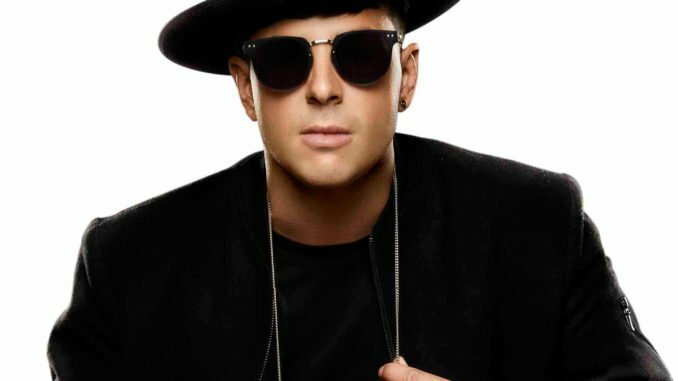 Timmy Trumpet: DJ, producer and live instrumentalist Timmy Trumpet is undoubtedly one of the most prolific performers in the DJ Mag Top 100. An award-winning, multi-platinum selling recording artist, Timmy has forged his way to the top of the industry alongside other influential artists taking the world by storm. His breakthrough release “Freaks” has reigned in over half a billion streams, reached six times platinum status in Australia and dominated the charts in ten countries, becoming the highest selling track of all time on Ministry of Sound Australia. His music career boasts an extensive resume spanning over twenty years from early beginnings as a classically trained jazz musician. At the age of thirteen Timmy was named ‘Young Musician of the Year’ before being granted a full scholarship to the Conservatorium of Music, where Sydney Symphony Orchestra’s Anthony Heinrich tutored him. Within two years he secured a position as the leading solo trumpet player in the Australian All-Star Stage Band, taking part in an extensive European tour covering some of the world’s biggest jazz Festivals. JONAS BLUE: Following the release of his hit single ‘Polaroid’ featuring Liam Payne and Lennon Stella, unstoppable UK producer/songwriter Jonas Blue has dropped his debut album ‘Blue’, out now via Positiva/Virgin EMI. ‘Blue’ contains all the songs that have seen Jonas Blue explode into the charts and go from strength to strength. Ever since he burst into the global conscience with ‘Fast Car’, a cover of Tracy Chapman’s classic which has gone 2 x platinum in the UK alone, Jonas has sealed his position as one of the UK’s biggest breakout stars, accumulating over five billion streams, 5 UK platinum singles (all featured on ‘Blue’), and over 30 million single sales worldwide. With ‘Rise’ fast becoming one of the biggest hits of the year (with over 680 million global streams already), and new single ‘Polaroid’ hot on its heels with over 40 million streams, the long-awaited ‘Blue’ cements Jonas’ position as a superstar producer and master pop songwriter. Pulling in a host of A-list guest features as well as new and upcoming artists, ‘Blue’ includes a collaboration with the much hyped Canadian/Columbian singer-songwriter Jessie Reyez as well as tracks with Joe Jonas, Zac Abel, Nina Nesbitt, Liam Payne and Chelcee Grimes. FEDDE LE GRAND: Enjoying artistic freedom afforded to only an elite few, Fedde Le Grand is a masterful pioneer of electronica, considered by countless fans and artists as one of the single most defining figures in house music. Whether as DJ or producer, Fedde’s influence can be felt throughout the electronic landscape; his creative beats, grooves, melodies and rhythms surround us all and have done so for many years. 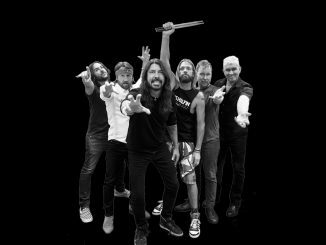 He’s been credited countless awards and remixed the biggest artists around – from Coldplay, Madonna, will.i.am, Robbie Williams, Everything But The Girl, and Fatboy Slim, to Shakira, Rihanna, Mariah Carey, Faithless, and his own all-time musical inspiration Michael Jackson. He’s featured the top half of the acclaimed DJ Mag Top 100 for well over a decade and has just returned to an incredible #22 after first entering at the same position all the way back in 2007. Le Grand is here, to stay. When it comes to solo records it was the seminal electro track ‘Put Your Hands Up For Detroit’ that not only brought Le Grand to global attention, but breathed fresh life into a stagnant house scene. MaRLO: Australia’s number 1 DJ, MaRLo has become synonymous with a sound and a feeling that has electrified crowds worldwide. Dutch-born and Australian raised, the globally in-demand DJ and producer has constantly evolved his own “MaRLo sound”, cementing his reputation as a genuine musical powerhouse. As well as his number 1 ranking in Australia’s “ In the mix” voting competition, he was also ranked #49 in the DJ Mag 2016 poll. 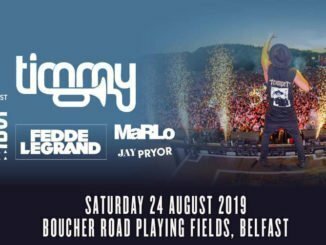 Jay Pryor: If your first big break was a co-production with Steve Aoki on Louis Tomlinson’s smash hit single Just Hold On you’d think you’d made it, but young Irish house producer Jay Pryor seems to upgrade his goals daily. 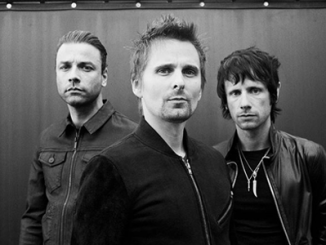 Tickets £37 + booking fee on sale Friday, March 1st at 9 am from Ticketmaster.